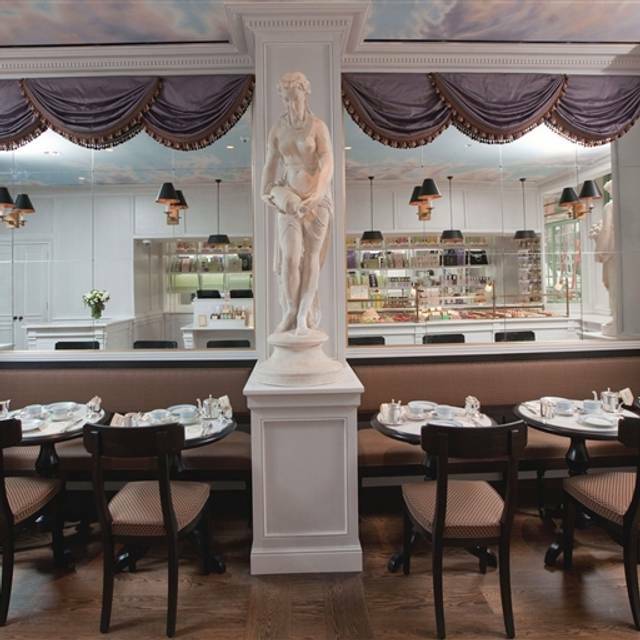 Whether celebrating a special occasion with family and friends or hosting a corporate event, “Laduree SOHO” can accommodate all your special event needs. Please note that on weekends "Laduree SOHO" can only accomodate large parties from 9am-11am or after 6pm. 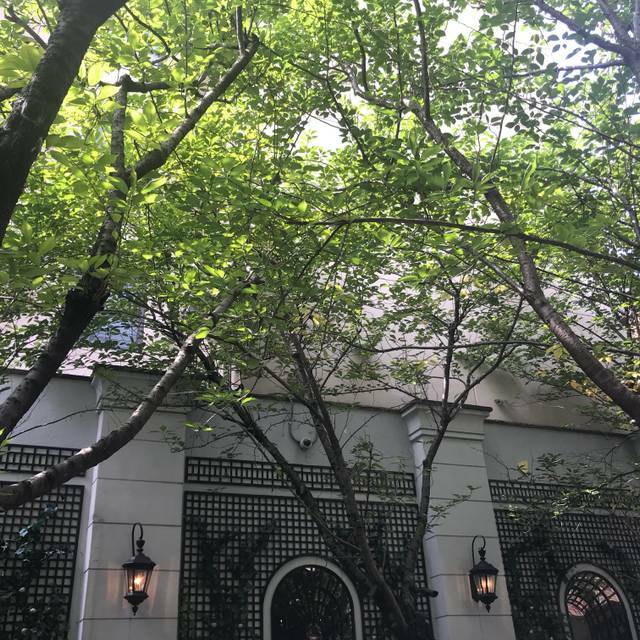 At over 2150 square feet, which opens onto a 2530 square foot tree-shaded GARDEN, the new Ladurée consists not only of a lovely boutique, but also a tea salon and restaurant. This exclusive address will offer several salons of exceptional character, each with its own decorative ambiance, in the Ladurée style. All the rooms are decorated with custom-made furniture and unique pieces, collected from the finest Parisian antique shops. Love the ambience, it's a little bit of Paris in soho. It never let's me down when I bring friends and family. Went there with my niece for Afternoon Tea Time. Amazing tea and pastries, especially the macarons of course, but disappointed with the finger sandwiches. The service is friendly though they did forget to replenish our hot water. Would definitely come back for a different meal and sit in the garden (still closed for winter when we visited). 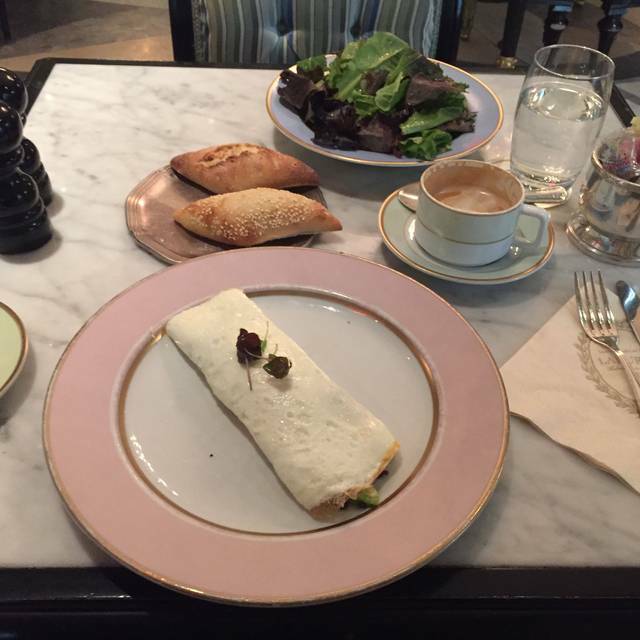 So my daughter and I had a nice little lunch date at Laduree, and I enjoyed the experience. Now my daughter however, really enjoyed it very much! We walked through the bakery/cafe area to the host stand at the entrance of the dining area. The host was friendly and professional and seated us within a few minutes. Upon entering the dining room, my daughter was immediately impressed as a smile came across her face, as the decor was very nice, especially for my little girl. The waiter was nice enough, although he didn't say much, but service was great nonetheless. We ordered french toast with maple syrup and ice cream and poached eggs with canadian bacon, and crab cakes for appetizers, all of which were very tasty. For dessert, we had the choice of 4 macaroons of course, and they were delicious. Afterwards, we walked through the outside patio dining area to take some pictures and it was quite beautiful! Unfortunately for us, it was not available for dining just yet for it was a bit too early in the season, but we do plan to eat out there next time. 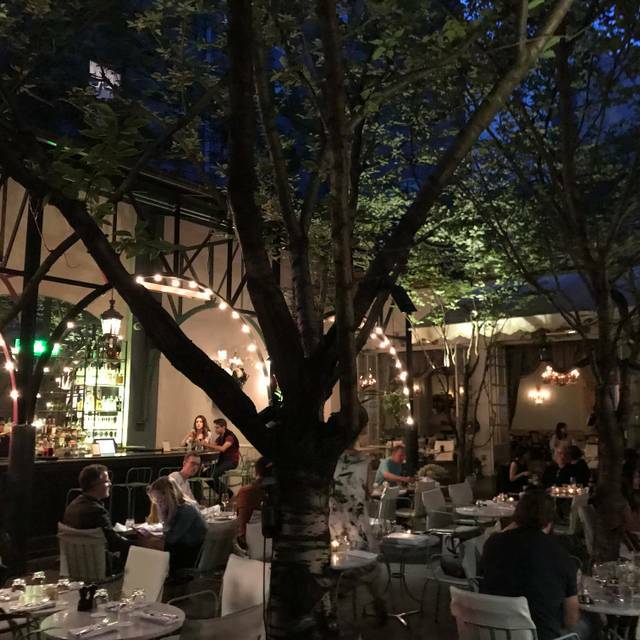 Overall, the total experience was wonderful, food and service was great, and the ambiance was really over the top if you love the whole French theme, like many little girls seem to enjoy. The only negative I can think of is that the glass cups that they poured the water into smelled bad. I know it was the cup because we ordered bottled water. And also, one piece of advice I can give you is to order the macaroons by the piece and not by the box. Choice of 4 macaroons is $11.50 and a box of 6 is $21.00. You do the math! Then again, some people really love the box, just as they love the whole theme of this beautiful restaurant and their famous macaroons! Definitely worth a visit, especially if you have a daughter, or a princess for a wife, and definitely instagrammable! We sat down for breakfast at 9am right as they were opening so the dining area was empty and quiet. The food came out fast and was so delicious. The portions sizes are medium/small but very filling. The place is so gross with dirty fabric chairs and table setting. Desserts are good. I definitely do not recommend going there for brunch though. The lobster roll tastes like fake fish from can. Egg benedict and other brunch dishes were just ok. Def not worth $200 for 4 people's brunch. My daughter and I had a reservation for outdoors and we were seated indoors. I then asked for a table outdoors and then we waited 10 - 15 minutes for what was not an outdoor seat. All servers seemed confused as to what they were doing. We waited too long for service at our table. One man in a suit took our initial order for an appetizer and a bottle of champagne that was never received. His job was worthless as he seemed to walk around and appear to look at tables, but do nothing. 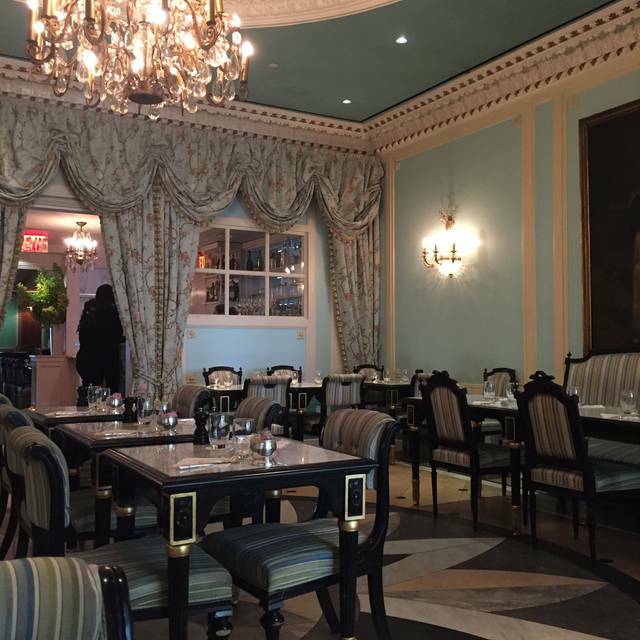 My daughter has worked off and on in the restaurant service industry in NYC and was extremely disappointed with Laduree's restaurant. Also, no one knew the correct way to pour alcohol. I had seriously considered having a bridal shower for my daughter at this location and was thankful I didn't. I eventually stood up and walked to the front of the restaurant and asked for a manager. After explaining the lack of service and confusion to the manager, things got better, but not significant to write home about. My daughter and I did have one waiter, George, who was wonderful, but then he went on a break. George, you really must seek employment at a new restaurant!! I am not a huge fan of compensation when meals go astray, but when they only took off dessert, I felt it offensive. We should have received a free meal with such incompetent service! 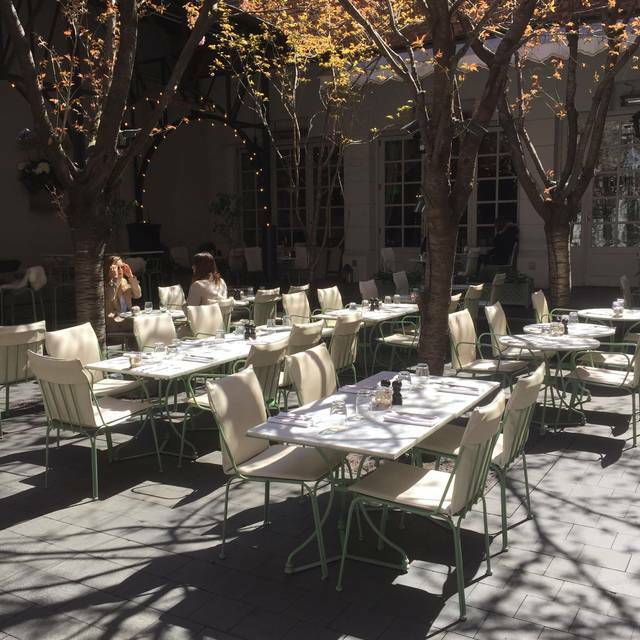 Great brunch spot with a group of girls. Food was outstanding. Service was fair--hard to get coffee refills, had to ask twice for bread to be brought to table, server seemed impatient with questions about the menu. Chair was broken and dishes were worn out. But decor at ambiance was lovely! I was a little nervous about my upcoming trip to Ladurée based on some of the reviews that I read which reported that customer service was poor and that the employees were rude and/or snooty. Fortunately, I didn’t experience any of that during my visit. I made a reservation through OpenTable, but arrived about 15 minutes early. The hostess was nice and offered to seat me and my dining partner early. While the waiter wasn’t as “attentive” as I’m used to at other (American) restaurants he was very responsive any time I flagged him down. Any request I made was answered with an “of course” in a very polite manner. I’m gonna chalk the difference in his attentiveness to cultural differences as I believe he was French. We received our food (which tasted EXCELLENT) in a very timely manner...no complaints about cold food, or receiving the food before getting our drinks. Afterward, I bought macarons and tea at the little counter upfront. The man who helped me, who also appeared to be French, was very friendly and had no problem going to the back to get some of their signature Marie Antoinette tea that I wanted in bag form. All in all I had an enjoyable experience and look forward to going back at a later date. Can’t believe I paid total $18 for the driest avocado toast I’ve had, served on a very dirty plate with stains from previous food. Overall experience was a disappointment, because I did expect the garden to be open but it wasn’t. Everything just felt very tacky. One of favorite places in NYC. Outdoor area is so nice and the service is amazing. The evening was just mediocre. My boyfriend and I enjoy Ladurée because we’ve had some of our first dates at the ones in nyc. Lately, the SOHO location has been slacking. Food is mediocre, the utensils and plates have been dirty, and our seating always seems like the chairs are off balance and the tables are messy (dirty napkins, water glasses are finger print smudged) and the prices are New York! $25 for a plate of mediocre Mac and cheese (which tastes like Alfredo) and Scallops that only come 2-3 on a plate for $25+ . I would only choose this as a grab and go from now on. The seating is not worth it half the time. I and my husband came here for our anniversary brunch. We liked the pastries so much and the Ambience is too good. We would love to come back. Expected to be royal type but did not experience any. Foods were not good, very noisy, not quiet at all. You would think you are at the night club or bar. Environment was ok but not clean, floor was dirty and slippery. Bathroom was extremely dirty, tissue, water were all on the floor. Price is not overprice at all but not worth to go again. Although everything was lovely, I really wish you had more gluten free options- I was drooling looking at the delicious display of pastries and bread that the other customers were enjoying. We were only able to have one pastry and no bread which was a bummer. What a disaster. 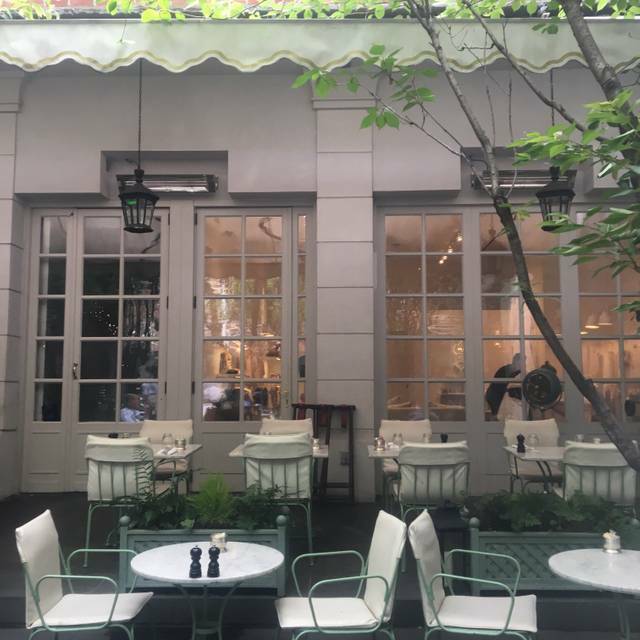 Having been a big fan of Laduree in Paris, we were so excited to experience tea at Laduree Soho just a few blocks from home, but the experience was really disappointing. We reserved outside and then were told that would not be possible, even if we wanted to wait. Next we went to our table, they ran out of teapots? The service was a mess. We got an email that we missed our reservation from open table so asked a hostess to mark us as having arrived. She could not have been ruder!!! I felt incredibly uncomfortable as she sighed, rolled her eyes and stood over us typing into an ipad for 5 minutes. Then the tea came. The sandwiches were stale and not even filled all the way, i had to ask 3 times for more hot water in our tea (since we didn't have pots). The whole experience was just sad. I had a good time brunch in at Laduree. The waitress had good recommendations. She had too many customers to serve. She was pleasant. This was my second visit to lottery. I love the unique food and drink offerings and the atmosphere! Service was so so made a mistake on the bill. Overall experience was good. Enjoyed a perfect cup of tea while reading my book club book. Music too loud for a quiet mostly empty Tuesday morning. Fried egg was served sunny up and a little undercooked. Always feel special dining here and always end with one of their world famous macaroons. 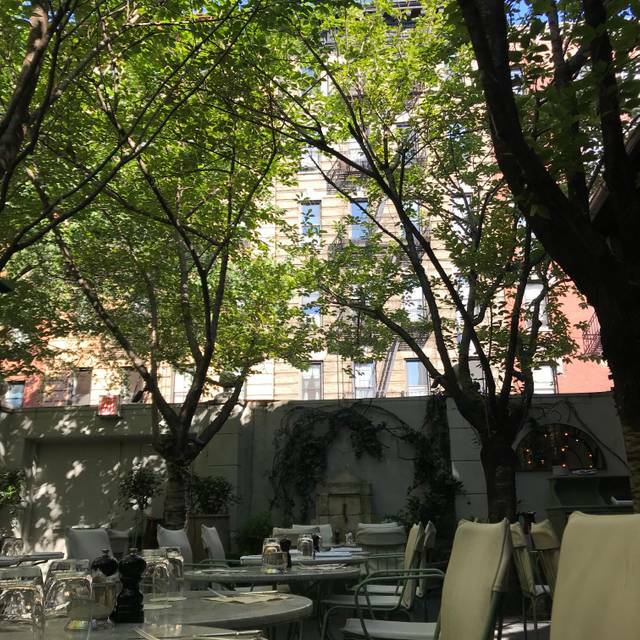 We come to Laduree for brunch every time we come to NYC. The food is always good and the tea is always divine. Bad service and bad food - Had to stand to get attention, server went on break. Lovely afternoon tea! Enjoyed the atmosphere. Food was delicious. 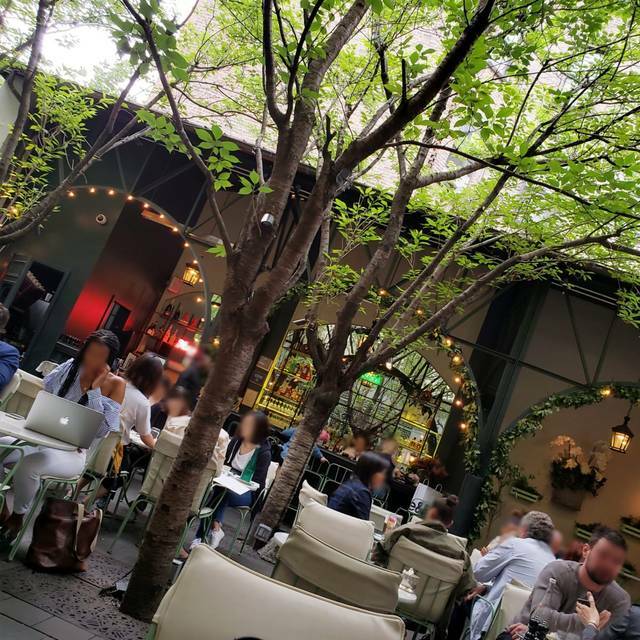 I reserved outdoor seating and was seated indoors, which was not really a problem because the inside was just as nice and not too crammed. Our waiter was awesome and super attentive. The food was tasty, but the servings are on the smaller size. Their macarons are the best in the city! I brought a guest from out of town here for tea on Saturday. We love the macarons and pastries and these lived up to the delicious expectation we had from previous Laduree purchases. However, the service was abysmal. We waited 25 minutes after being seated before I had to flag who I believe was a manager for service. She didn't offer to get us a waiter/waitress, but instead took our order herself. This presented problems the rest of the time, where we couldn't get our check at the end, silverware, or water refills. I will recommend friends to make purchases at the front but to not go here for any sit-down meals. Yuck! I never imagined it would be as bad as it was! Booked it on a whim, knowing it was touristy but thought it could still be nice. I can usually tolerate bad service if the food is good, and great service when the food is ok, but in the case of Laduree - you get neither good food or good service. food was served cold - and I mean all of our dishes and we could have complained, except we never saw our waitress again - not to ask us how we were doin, or if we needed anything else. Not even to give us the check. If you are coming here because you think it may offer you a special experience, believe me, you are wasting your time. Save your money $$- it would even be better spent at the Chobani yogurt bar down the street!!!! We thoroughly enjoyed our family Birthday Celebration. The entire dining experience was perfect. Service was slow. Food lukewarm and just okay. Disappointing. Food wasn’t anything spectacular- the price is not the most expensive but also not a bang for your buck. I liked this place better as a dessert stop rather than the restaurant. The service took forever. It took the waiter 25 minutes to take my order. Not as happy as I thought I’d be leaving that place. Such a beautiful restaurant with great ambiance! Everything was tasty! The service was good (a few people were amazing! ), but our waitress was not super friendly. It was also annoying that you couldn’t switch between a Bloody Mary and mimosa for the 2 hour unlimited brunch cocktails but still worth it :) Overall loved it and would come back! Pastries and coffee were delicious and pretty to look at. The place is fabulous. Terrible service. Was told by one waiter that they did not have the tea time menu item because they ran out of finger sandwiches, yet we heard the table next to us order it with no problem. They brought out our food first and we were waiting THIRTY minutes for our tea/hot chocolate to arrive. Will never be going back here. Paint pealing on the walls, furnishings stained and dilapidated, the rent must be too damn high down there in Soho. I knew going for a 6:30 dinner it would be quiet there but the staff checked out during the last hour of our meal and that was kind of disappointing. It's cute in the front, so just make it a quick visit. This is a great place for some coffee and pastries. Instead of having regular brunch foods we decided to order from the pastry options and had dessert for brunch! It was also great to see that they could make a cappuccino with soy milk. Great for a cute date or special occasion with awesome pastries.